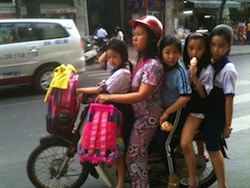 I spent about 4 months in Saigon in early 2011. It was my first trip there, and I wasn’t sure what to expect but Saigon was all the buzz. Having lived there for four months, I can understand why people love it so much. In many ways, it’s a super-congested, fast-paced city, filled with millions of people and even more motorcycles. You will never lack for things to do or places to go in Saigon. It’s filled with beautiful gardens, houses, stores, coffee shops and pagodas. But, on the other hand, despite its size, Saigon has a small-town feel to it. This comes from its people. They are a very warm, hospitable, and welcoming people. And although I spoke no Vietnamese, I found that the people’s warmth and language of the heart many times overcame the language gap. I stayed in an apartment owned by a 45-year-old woman and inhabited by her, her 3-year-old son, her mother, four other renters, all Asians, plus two housekeepers. Something was always happening in the house. I felt very welcomed and often would be offered some Vietnamese delicacy to try. Again, very warm and hospitable people, always wanting to make you feel welcome and at home. The neighbourhood where I stayed, in District 3, was near a school. One of my fondest memories is of the 60-year-old man who would show up every day on his bicycle and a little barbecue grill on the back of his bike. He served some sort of meat on a stick, wrapped with some sort of leaf. He grilled these, then served them in a dipping sauce. Pure ambrosia. I ate many a lunch of these street-food delicacies, all for about $1 US. Another food treat I discovered in Saigon was “Nuoc Mia”, or sugarcane juice. They take the stalks, run them through a mangle, and mix in a little lime, and serve you the most refreshing glass of juice — all natural, healthy, and super delicious, for about 25 cents. 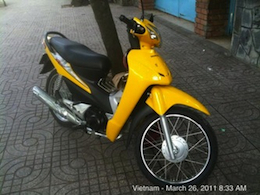 I rented a 125cc Honda Wave (for a mere $50/month) and if you’re not faint-hearted, it’s the best way to get around the city, in my opinion. I have motorcycled all my life but I’ve never been in a city where there are so many bikes. During the morning or afternoon rush hour, the streets are filled with literally hundreds of thousands of these bikes. Everyone relies on them, and I came to love them. 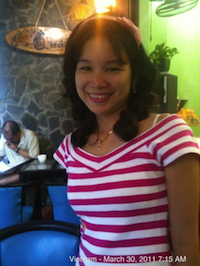 All in all, I loved my time in Saigon and made some great friends, both Vietnamese and foreigners. It truly is a city and society on the come. You’ll feel the energy everywhere. Don’t miss it.